Despite assertions by Hillary Rodham Clinton that the Uranium One scandal has been debunked as “fake news,” there exists ample evidence to suggest otherwise – with additional corroborating evidence being revealed almost daily. In today’s environment where few people care to read a report that extends beyond a sentence or two, the facts behind the Uranium One scandal are often readily dismissed due to its transactional complexity, the complicity of those involved, and the media’s collusion in keeping this story under wraps. That is beginning to change, however, as more information is being forced into the open by a precious few members of the conservative media and truth-seeking journalists. In the mainstream media, Sean Hannity has taken point on exposing this wholesale web of corruption and sale of our national security. His frequent guests including John Solomon of The Hill and Sara Carter of Circa news have also been at the forefront. Perhaps the most damning evidence today, however, exists in the form of a FBI informant who possesses video and audio evidence and documentation to support the allegations of the use of positions of power and influence to sell one of our nation’s most important natural resources, and the abuse of power to cover it up. Peter Schweizer, author of Clinton Cash, The Untold Story of How and Why Foreign Governments and Businesses Helped Make Bill and Hillary Rich, was one of the first to document the story behind what has become known as the Uranium One scandal. Mr. Schweitzer painstakingly detailed the events that led to the transfer of 20% of uranium from the United States to Russia through a complex and confusing maze of domestic and foreign businesses. Building upon that foundation, the American public is now learning much more. The information being uncovered is creating an even stronger case of self-enrichment at the cost of national security. The Uranium One “scandal” is not a scandal at all, but a host of potential crimes against the United States. Not just one crime, but many overlapping crimes. It not only involves the Clintons, but many others who potentially conspired to use their positions of power and political influence to facilitate one of the most egregious crimes against America – and others who assisted in covering it up. The following is presented as a detailed (but not exhaustive) outline, in chronological format, of key people and events comprising what is known as the Uranium One scandal. It is intended as a reference resource for those truly desirous to understand the depth and scope of one of the most disturbing allegations of criminality in modern U.S. history. September 6, 2005: Former U.S. President Bill Clinton and Canadian billionaire Frank Giustra appear together in Almaty, Kazakhstan. The stated purpose of their trip was allegedly humanitarian, where they were to help HIV/AIDS patients gain access to certain drug therapies. Interestingly, Kazakhstan, a nation of 15.4 million, did not have an HIV/AIDS problem as pointed out by Peter Schweitzer. In fact, only about 1,500 people in Kazakhstan needed such treatment. Kazakstan, however, has rich natural resources estimated at $5 trillion, including uranium. Interestingly, the Almaty trip was also organized, in part by Sergi Kurzin, who once worked for the former federal fugitive Marc Rich, who was pardoned by Clinton on his last day as President. While the Giustra-Clinton partnership began publicly in 2005 through the establishment of the Clinton-Giustra Sustainable Growth Initiative, Clinton and Giustra have a rich history as well that predates 2005 and traces back to Arkansas and mutual friends, Jean-Raymond Boulle and Jim Blair. February 2007: The head of Kazatomprom, Mukhtar Dzhkishev, meets with Bill Clinton at his Chappaqua residence to work out a new business deal with Frank Giustra. Also that same month, Uranium One buys UrAsia Energy Ltd for $3.1 billion. However, this was not a typical purchase, but a reverse merger. Giustra and his associates maintained a 60% controlling interest in UrAsia Energy Ltd. Giustra and associates announce a recurring commitment to donate $100 million and half of future profits to the Clinton Foundation. The deal would ultimately result in an estimated $145 million in contributions to the Clinton Foundation. January 20, 2009: Barack Hussein Obama becomes the 44th President of the United States. January 29, 2009: Hillary Rodham Clinton becomes the U.S. Secretary of State. Note: Rosatom also built the Bushehr nuclear reactors in Iran and supplies Iran with uranium. Wikileaks Revelations: Diplomatic cables sent to Hillary Clinton in 2009 and during her tenure as Secretary of State confirmed that she knew of Moscow’s nuclear ambitions via Rosatom in Ukraine and Kazakhstan, and knew that Russian military intelligence (GRU) was directly behind these nuclear ambitioons. June 9, 2009: Kazakhstan government arrests head of Kazatomprom (former Clinton Chappaqua guest Mukhtar Dzhkishev) on charges related to Uranium One deal corruption. The reason? Putin wanted the uranium in Kazakhstan and put pressure on Kazakhstan’s dictator to keep his hands off the uranium. This prompted the arrest Dzhkishev and jeopardized the sale of Kazakhstan’s uranium to Rosatom. The Clinton State Department intervened. Hillary Clinton used her position to threaten to withhold financial aid to Kazakhstan, which resulted in the Rosatom purchase to proceed. The reason for Rosenstein’s involvement is simple and relates to the existence of the government whistleblower (Mr. Campbell). The Russian commercial agent responsible for the sale and transportation of uranium from disassembled nuclear warheads from Russia to the U.S. is Tenex, a subsidiary of Rosatom. The U.S. arm of Tenex is known as Tenam USA, based in Bethesda, MD and headed by Vadim Mikerin. Mikerin was responsible for managing Rosatom/Tenex contracts with U.S. uranium purchasers, thus giving him leverage over U.S. companies. He used this leverage to extort and defraud U.S. contractors into paying highly inflated prices for uranium, enriching Kremlin officials and compromised the companies who paid the bribes. More importantly, the informant learned from Mikerin (and others) that Rusian nuclear officials were trying to penetrate the inner circles of Bill and Hillary Clinton and the Clinton Foundation. September 21, 2009: Robert Mueller, then-FBI Director, personally delivers a 10-gram sample of highly-enriched uranium to the Russian government at the behest of Secretary of State Hillary Clinton. This was learned through Wikileaks via Twitter (on May 17, 2017) in reference to a State Department cable. 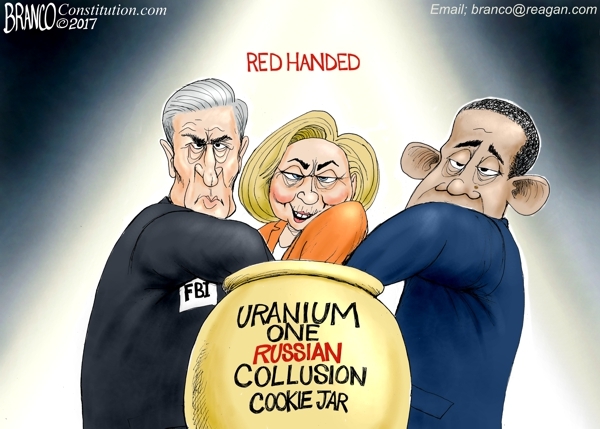 The uranium was allegedly confiscated from smugglers in Georgia, although raises legitimate questions about the role of Mueller with the Clintons and Uranium One. Mid 2009 through Late 2010: While Secretary of State, Hillary Rodham Clinton intervenes on multiple occasions on behalf of Uranium One/Rosatom and the inner workings of the transfer of the sale of U.S. uranium assets in her official capacity. June 2010: U.S. intelligence agents break up Russian spy ring in the U.S., arresting ten-(10) sleeper agents/spies. A leading fundraiser for Hillary Clinton and Clinton friend was one of the spy ring targets. June 29, 2010: While Hillary Clinton was Secretary of State, Bill Clinton collected $500,000 (one-half million dollars) for a one-hour speech he delivered in Moscow, his first Moscow speech in five years. The speech was given at a seminar hosted by Renaissance Capital in Moscow, a Kremlin-controlled investment bank populated by former Russian intelligence agents with close ties to Putin. Of important (and recent) note is that the FBI informant with direct knowledge and evidence of corruption, bribery, and other related crimes were allegedly never reported to CFIUS. Based on more recent research, this vital information was intentionally withheld by those at the highest levels within U.S intelligence agencies and the top judiciary position(s). It should be abundantly clear, from this rather abbreviated timeline alone, that U.S. government officials, including but not limited to Hillary Rodham Clinton as Secretary of State were instrumental in the selling of one of most precious natural resources to foreign interests for self-enrichment. Such enrichment is estimated to exceed $145 million in quid-pro-quo contributions from foreign entities, including and especially those representing Russia, to the Clinton Foundation funneled through shell corporations. The bottom line: The American people deserve answers. Julius and Ethel Rosenberg were executed on June 19, 1953 after being convicted of committing espionage for the Soviet Union. They were accused of transmitting nuclear weapon designs to the Soviet Union when, at that time, the U.S. was the only country with nuclear weapons. Why is there an investigation of collusion between Russia, Donald Trump and the Trump campaign when there is smoking gun evidence of collusion and more between Russian and other foreign assets, Hillary and Bill Clinton and the Clinton Foundation?